In class this quarter, I learned how to use Le Franc’s aging and cracking varnish. It’s a really cool supply. What’s interesting about it is after following the instructions on creating the cracks you rub black oil paint into the cracks to bring them out and remove most of it (depending on the look you want) from the picture. You can rub the oil off so that it leaves a heavier look around the edges causing a vignette look. You can also use other colors of oil paint. I always wanted to try white with a dark picture, but haven’t yet. Our assignment required us to use a bird as our subjects. 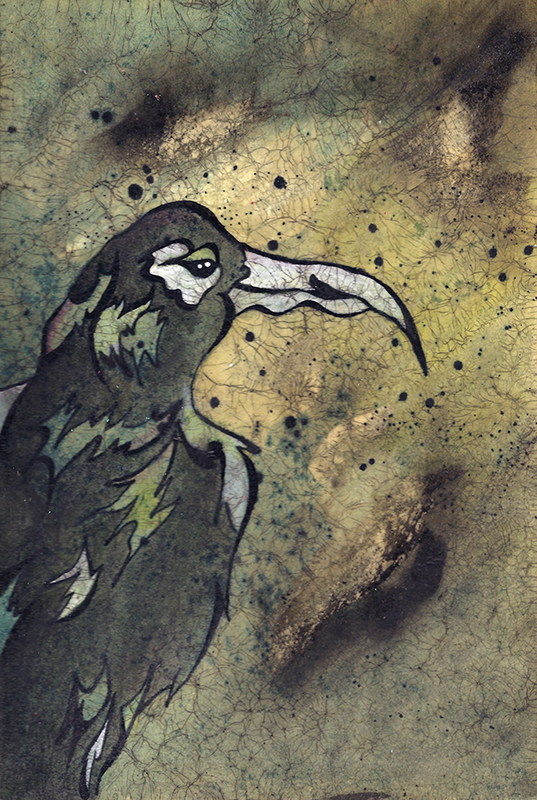 One of my first samples I decided to use a crow (raven). I know its kind of cliché, but I always have them in my head. And I’m sure many people think of Edgar Allan Poe’s poem The Raven. The impetus of adding the cracking is Pol Turgeon’s technique, which also focuses on using ink, drawing with different line weights, watercolor, and gesso. It’s a lot of fun if you want to try something new out. PS. I got the LeFranc kit here, but you can also get it here.